Dexion floor or beam mounted pull-out units allow increased access to goods stored within a racking system. Pull-out Units function as drawers to give easy access to pallets stored from three sides when extended from racking. Items can be kept in their original pallets and picked by hand directly from the racking. 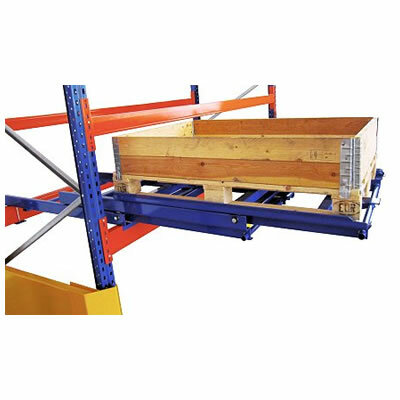 By giving access to the pallet in the extended position, pull-out units eliminate the need for any clearance distance above the pallet in the racking system, allowing more space to be used for storing pallets. 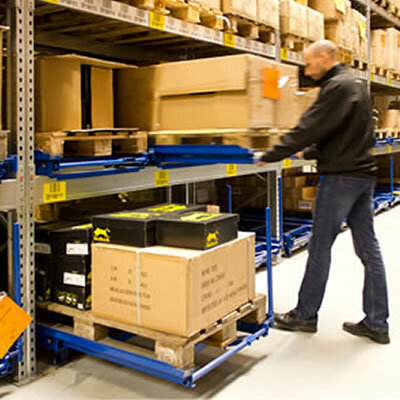 The easier and improved access to the pallet benefits picking rates and reduces accidents, improving workflow and encouraging a safe working environment. Units can also be designed for special dimension pallets, for more information on how Pull-out Units can assist in your warehouse operations or on the installation of a Pull-out Unit system, speak to one of our experienced sales team on 08082399422.